Pretty, painted nails are a style must in our books (who doesn’t love a mani? ), and since spring is finally here, we thought we’d let you in on some of the top nail polish trends for the season. From polished pinks to glamorous glitter to soft neutrals, there’s bound to be a shade you fall in love with. Creamy shades with just a hint of tint were a prominent sighting at several spring 2012 runway shows, including Giorgio Armani and Derek Lam. Pale pinks, girlish gray, soft beige and white are all poised for a warmer weather wake-up call. Try Deborah Lippmann’s Naked Nail Lacquer ($16), a crisp, clean beige. Quick nail tip: If you’re going for a barely-there shade, make sure your nails are smudge-free without chips or scuffs. These hues need upkeep to look their best and suit a more rounded nail shape. From pretty rose pink at Chanel to girlish cherry red (with matching lips, natch) at Christian Dior, flirty, feminine hues are a must for spring. Whether you’re going out or staying in, these hues are fun with an elegant twist. Try Orly Nail Lacquer in Pixi Stix ($8). Quick nail tip: Take a page from Dior’s book and match your nail polish shade with another makeup color, from lips to eyes for added glamour. Classic, timeless and always chic, red nail polish has made its way back to the style spotlight (not that it ever leaves for long). Models flaunted ravishing red polish at Jason Wu, which proved to match the energy of the collection perfectly. 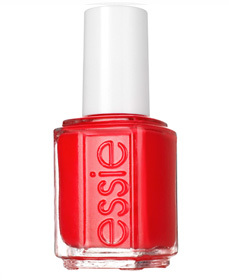 Try Ole Caliente ($8) from Essie’s spring 2012 collection. Quick nail tip: Give your red nails even more va-va-voom by applying a high-shine top coat. Chartreuse was another get-noticed hue that popped up on spring runways (Karen Walker for one), and this is a trend that just screams spring to us. What better color to shake off the last of winter and say hello to warmer weather? 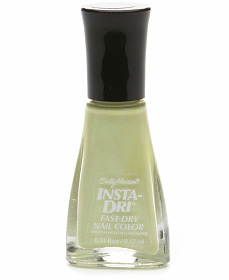 Try Sally Hansen Insta-Dry Fast Dry Nail Color in Chartreuse Chase ($5). Quick nail tip: Not sure you can pull off canary yellow nails? Scale back instead and opt for a creamier version of the shade. Pastel yellow is a great nail polish color that can even work for the office. Sequined tips? Why not! We spied them at DSquared and we swooned. Models at the spring Alexander McQueen show sported nails featuring an eye-catching reflective pearly finish and tribal print took center stage at Pamela Love. Nails this spring are all about getting noticed. Try Nails Inc. 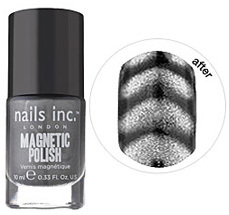 Magnetic Polish ($16), a unique polish developed with magnetic particles that form a unique metallic pattern when applied. Quick nail tip: Go one step outside your comfort zone and ask your manicurist for something that will stand out. They’re just nails after all – the perfect way to start small when pushing style boundaries.